Today was high tea day so I just had porridge for breakfast before heading over to Herbert's bakery to pick up a loaf of white for sandwiches. 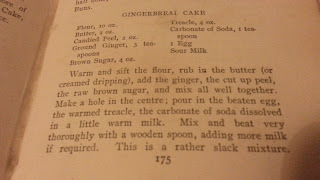 I'd made gingerbread the night before, and also planned to make lemonade, a salad, and sausage rolls. I also had sweets from yesterday left, so I put those in a jam jar. They looked really pretty. Can't remember the last time I had a sweetie jar! The lemonade was easy and went a lovely yellow colour from the peel, no colouring needed. Two and half lemons made about a litre of (non-fizzy) lemonade. I decanted it into an old M&S lemonade jar and put it in the fridge to chill. 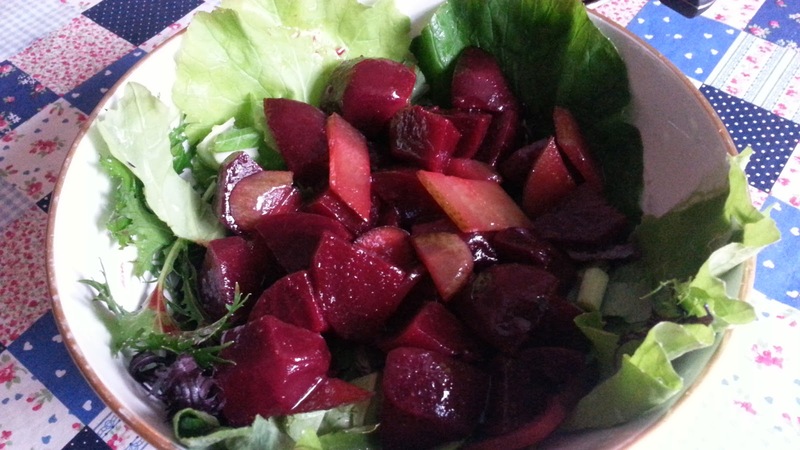 Salad options were limited so I took up one of the suggestions in the book and boiled a bunch of beetroots, cut them up and added a dressing, before slinging all this on a bed of salad greens. 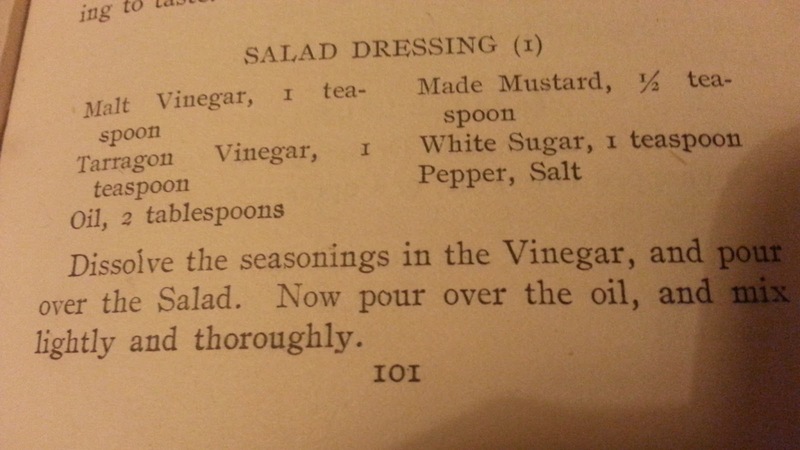 I used this dressing recipe but substituted cider vinegar as I didn't have tarragon vinegar. It was quick and tasted like a cheating honey mustard dressing. I made sausage rolls with leftover pastry from the pie, using plain pork sausages from the farmer's market. Homemade sausage rolls are easy, I often make them with bought pastry, but these ones with homemade pastry featuring lard were a little bit special. You literally wrap the sausages in pastry, with a double layer at the bottom, and stick them in the oven on a tray, with the double layer of pastry under the sausage to hold it in place. I made three rounds of sandwiches as that was all that'd fit on the plate: one of salmon paste (the traditional, bottled kind), one of ham and pickle, and one of egg and mayonaise. All with butter and the Herberts bread. Godammit those guys make a good loaf, squishy and yielding without being doughy, and nice edible crusts. 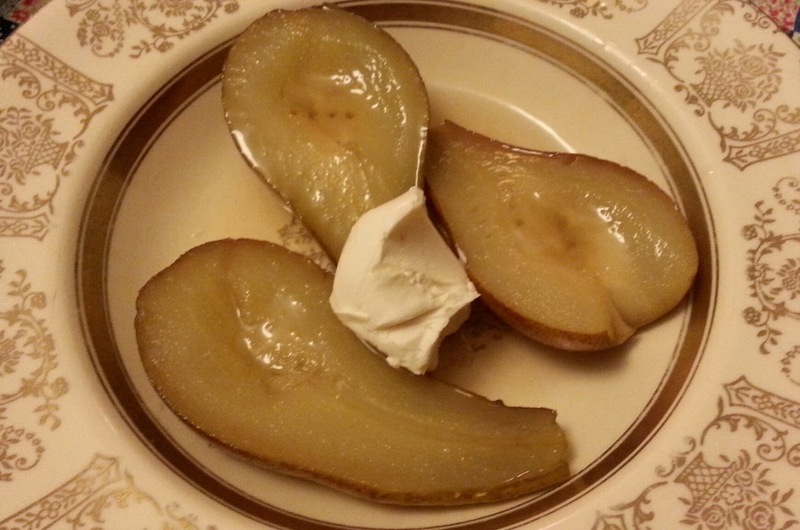 I also put a plate of pear halves on the table, since I had a few pears left and they were now ripe. 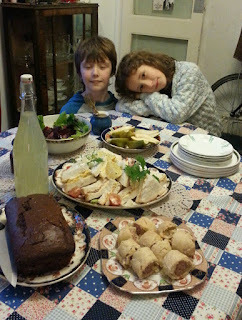 I'd invited some friends round, and was cruelly planning to test my creations on their unwitting offspring, aged 9 and 7. I'd just got everything on the table when they arrived, and was pleased the spread was met with 'oohs' rather than 'eews'. The first thing that vanished, to universal acclaim, was the sausage rolls. The lemonade was also in demand. I was a bit worried what the kids would make of the sandwiches, especially the salmon paste, but to my surprise it was the first to vanish, and by popular demand I made a second round! Personally I liked the egg sandwiches best, you can't beat a handmade egg sandwich with butter, salt and mayonnaise. We had a quick sandwich vote, two favourites for the salmon from the children, two votes for the egg, and one for the ham. The grownups liked the beetroot, I don't think it appealed to the kids, who were mostly waiting for the main act, which was the gingerbread. I was worried that without icing or filling it might be dry (I have made gingerbread before and found it dry) but I have to say it was excellent. (Even the children agreed). 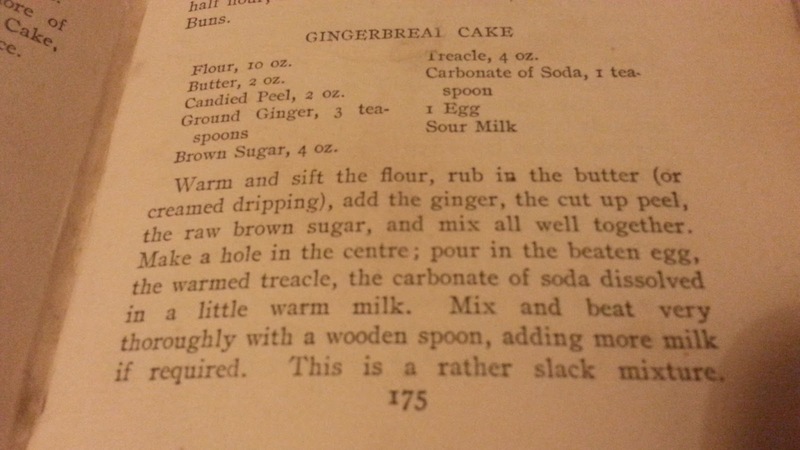 It was the sort of thing you'd appreciate if you were out on a long walk in the countryside; dark-tasting, not too sweet, and proper gingery with three teaspoons of powdered ginger. 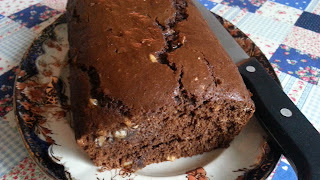 I would definately make this again if I wanted a cake to take on a picnic or journey, as it's quite robust and solid. I felt like this was a proper winter cake, perfect to get you through a damp winter afternoon. Which indeed it did. I also suspect it would be awesome as a dessert with a dollop of custard on it. The final item was the sweet jar, which turned out to be quite a talking point, the traditional sweets were new to the children, and there was a lot of discussion over what was what and what to choose. Everyone was bamboozled by the violet creams and their odd collapsing structure. I think I am going to keep a sweet jar, it looked so pretty, and there doesn't seem to be the temptation to eat your way through it all like there is with chocolates. All in all, a thouroughly excellent feed, and a good end to the week. This was the last meal I had planned from the The One Maid Book of Cookery, and when I closed it after the meal I felt rather sad and a bit emotional, because I've been wrangling with Miss Congreve's recipes all week, and starting to get a hang on how she thinks and does things, and by and large I've found her advice to be excellent. I feel like a friend came to stay for a week, taught me loads of amazing stuff, and then packed up and left again. I've definitely learnt a few good cooking skills this week, as well as specific recipes that I think will become staples. The things that I would cook again, without hesitating, are: the carrot soup, the poached pears, the one-pot macaroni cheese, and the ham and steak pie. The pie was amazing, and I would never have thought to make it like that. 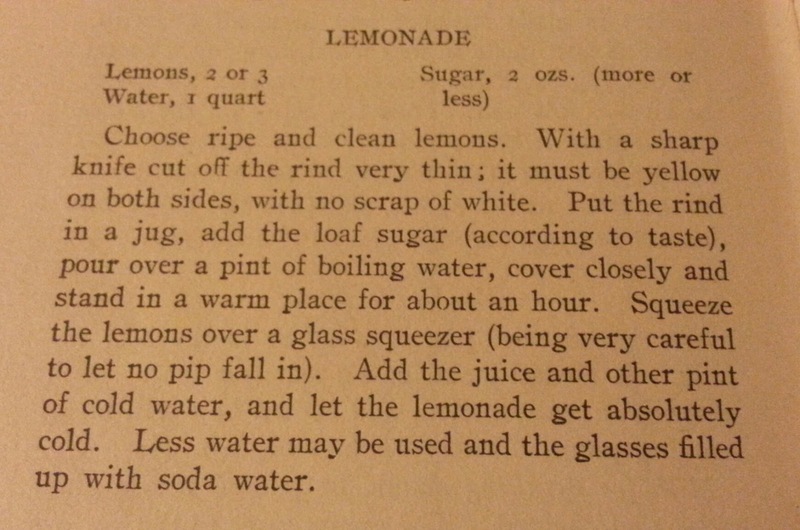 The lemonade. Also the salad dressing. The gingerbread seems like an autumn/winter thing, but I would make it again, and you never need an excuse for a plate of good sandwiches. Even - sorry - the fried brown bread! All in all, I've eaten really well, and the only things that I wouldn't bother with again would be the fish (what an effin' fishy failure that was) and the oatmeal porridge - can't see the point of it. 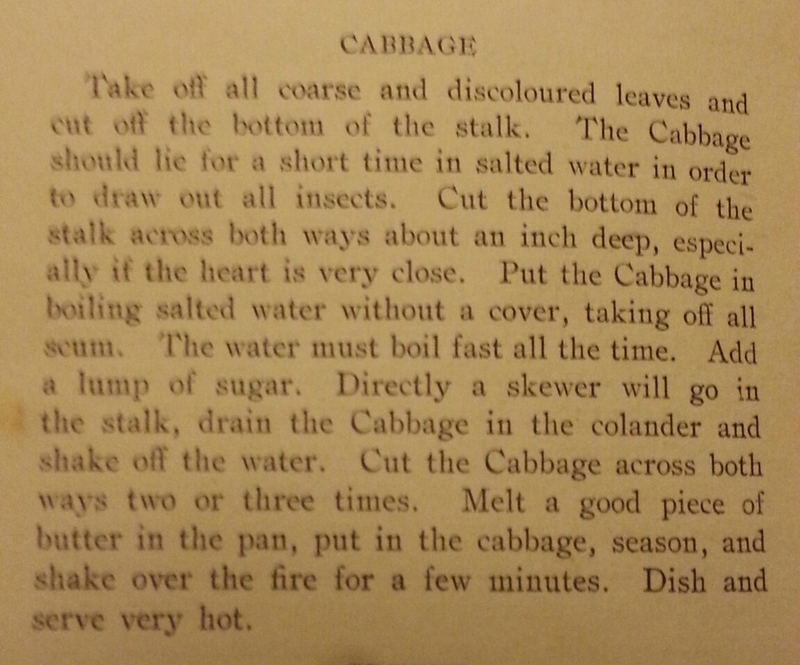 Probably the whole cabbage - it just took so flippin' long to cook. I feel like I've eaten more healthily than usual, mainly because I couldn't just wander into the supermarket and get waylaid by cake/chocolate/crisps. I was worried at the start of the week that I would end up eating loads of stodge, but actually, apart from Friday, I've eaten a perfectly reasonable amount of fruit and vegetables. What I have eaten a lot more of is meat, and quite a bit less of dairy things like cheese. I'm not sure if my sugar consumption has gone up or down - I feel a bit squeamish pouring sugar into recipes I normally wouldn't (eg the sugar in the salad dressing), and eating sweets, which I normally wouldn't, but I suspect that if I added it all up against the sugar I usually eat in supermarket goods, there probably isn't much difference. It's just that this way, I've noticed it more. The one thing that I did eat a lot more of was animal fats for cooking (dripping, lard) which I normally wouldn't eat at all. I'm not sure what the long term effects of that would be - certainly in the short term I feel pretty well. I've also drunk less alcohol than normal. 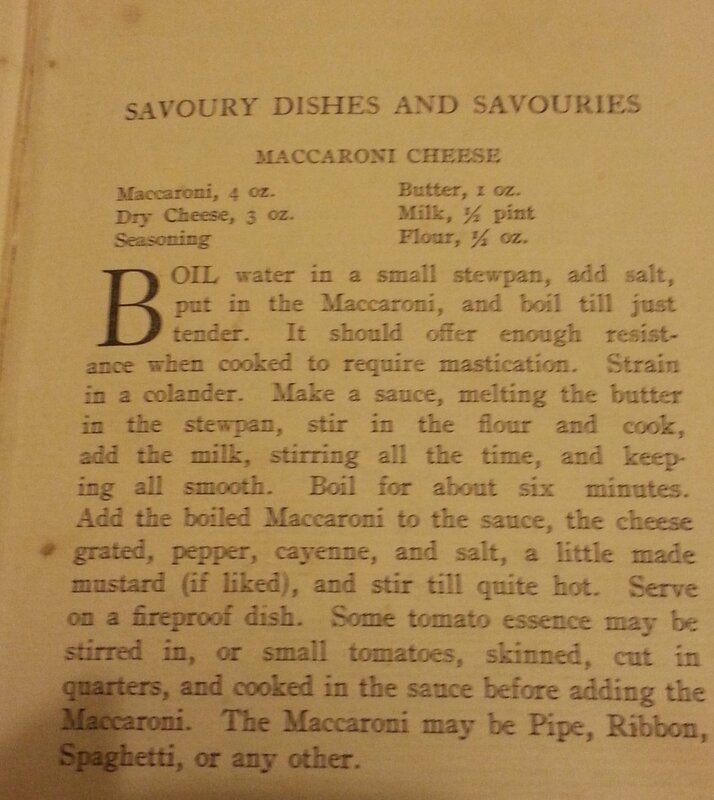 The main downside to eating a 1913 diet for a week, as far as I can tell, was the washing up. I don't feel like my cooking time went up extraordinarily (10%, maybe?) but I did spend quite a bit more time washing pans. The other thing that took more time was sourcing stuff. 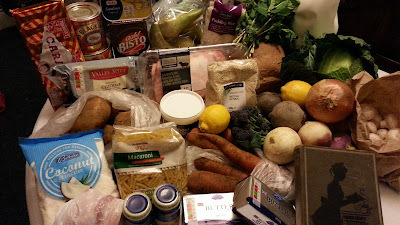 The upside of this was more conversations with people in shops about what I was cooking and what they had to offer. One thing I have noticed is that a lot of the things we are used to are cost-maximisers for the producers, and if you are prepared to put in a bit of time, some things become ridiculously cheap, or cheaper. The missing link to be able to do this is a bit of skill or knowledge, whichis where the book came in handy. The carrot soup, for example, cost about 75p for four decent-sized portions, and the delicious cooked pears about 50p for two portions. Cooking costs not included. I'm not saying its wrong to pay someone else to make food for you but I am going to be more aware of how much I'm paying someone else to do part of the work for me, in future. The one really knackering aspect of this was photographing and blogging everything I ate - I don't know how some people do it! 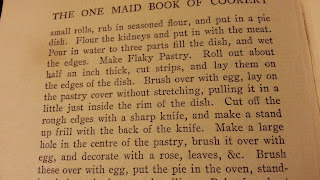 Incidentally if you want a copy of The One Maid Book of Cookery it seems you can get one for about £12 from an antique book dealer. 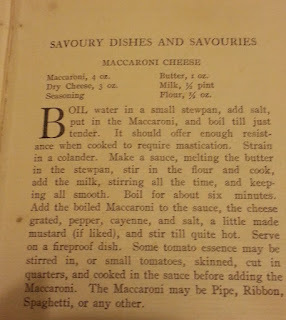 I don't know why somebody doesn't reissue it - it really is an excellent cookbook and I fully plan to go back and try a few more of its recipes that I haven't got round to this week. Not one of my finest hours, today. Woke up late, so decided brunch was the way to go rather than breakfast. Made bacon and eggs, which I'd been saving for weekend breakfast, but I was knackered so decided Friday warranted it. As well as bacon and eggs, I took Miss Congreve's advice on using up stale bread and made fried bread triangles out of brown bread which was getting on a bit. Reader, I cooked it in lard. It was delicious, and reminded me that fried breakfasts don't have to seven ingredients and fill a whole plate. When did we enter the era of fried breakfast inflation? I blame the 1970s. I was craving a bit of a treat since I was tired, so I decided, on my way into town, to take myself to the lovely sweet shop in St Nicks Market. 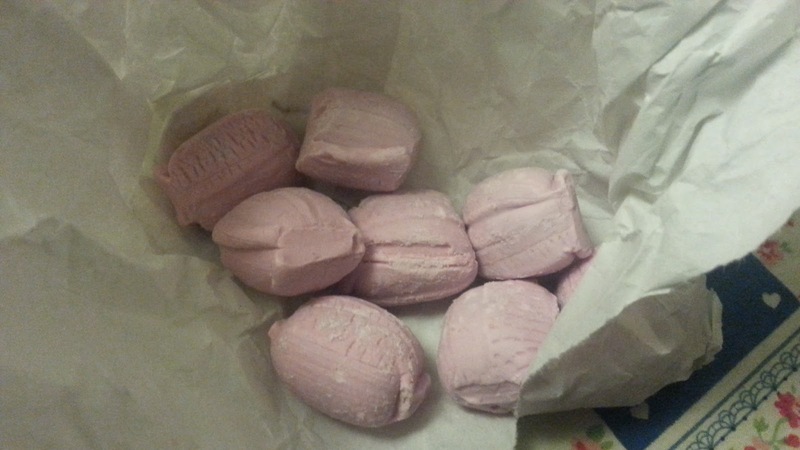 I bought some Scottish tablet, and also a small bag of violet creams, as they seemed like an Edwardian thing (there's quite a few references to crystallised violets in the book). They were quite odd and reminded me of soap, but not in an unpleasant way. They're massive, and then suddenly collapse, like a sort of sweet black hole, leaving a sugary, faintly evocative taste, like your granny's eau-de-cologne she kept for special occasions. Anyway at 70p for a bag of ten you can go and make your own mind up. They did look very pretty: you can get rose flavour, as well. It really struck me that this week I have had a lot more conversations with people in shops than I normally would. 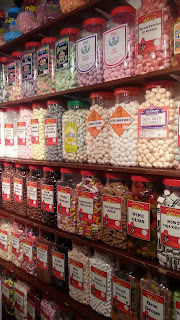 Also, going to the sweet shop is more fun than buying a Mars Bar. Dinner was not a success. First, I couldn't get the peas to make mushy peas. Second, I'd bought a bit of whiting: the book suggested I fillet it. I don't really know how to fillet fish and left quite a lot on the bone. 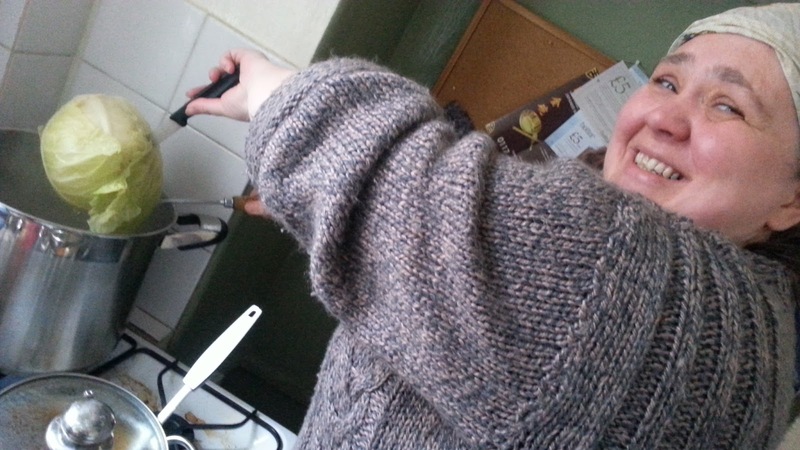 I then did the 'seasoned flour' thing which she suggested again. I cooked chips (half boil, put in the pan and shallow fry) and the chips were fine but the fish disintegrated into flakes and lost all semblance of a fish. 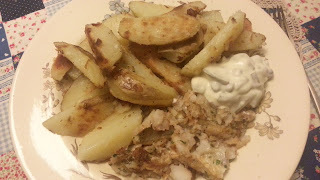 It tasted ok - quite strong, not the bland white fish I'd expected - but looked a mess and was really a pathetic quantity. I did whip up a bit of fake tartare sauce with mayonnaise, chopped gherkins and capers. I dunno if miss Congreve would approve but she does have gherkins and capers down on the list of things you should have in the store cupboard. I slightly have fear of fish (cooking, not in the sea) and I think I need someone to teach me how to treat a fish with respect. 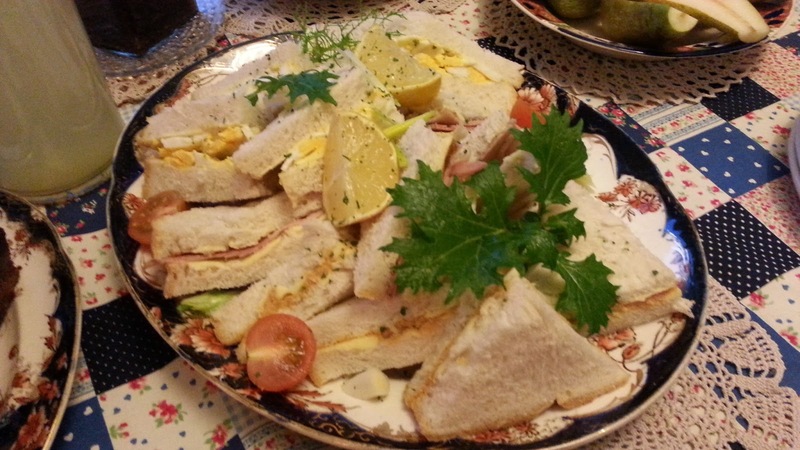 Tomorrow I am making a high tea for friends and am really looking forward to that. Saturday is the last day and I am actually quite sad at the thought of going back to 'normal' food. The cooking has been completely fine, but I will be glad not to have to update a blog every night! Not much to report today as I'd cooked so much I had enough leftovers for the day. Cold pie and salad for lunch - I managed to get a bag of salad greens in yesterday's farmers' market, so that's proof you can grow them here at this time of year. The pie was just as good cold as hot. 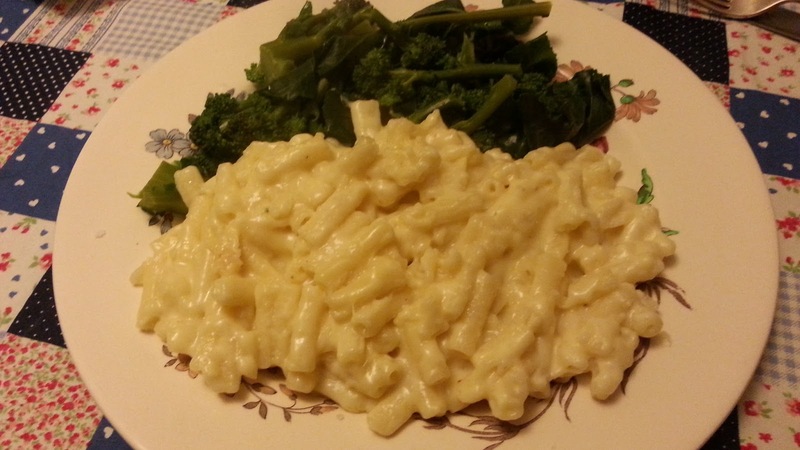 Leftover macaroni cheese for dinner. The only thing I tried making, since I was really dying for a dessert, was this, but since I didn't have any brandy I use a slug of whisky. It wasn't that great, the whisky was too strong and overwhelmed the other ingredients, and I couldn't get the cream to whip. I think the moral of this is not to make late-night puddings when you're tired. I did go to the local fishmongers to get a bit of fish for tomorrow. I know nothing about fresh fish and picked a bream on the grounds it was reasonably priced and local. The fishmonger them started cleaning it for me, looked suspicious and pronounced it bad, before checking the rest of the bream and sweeping all the remaining ones off into the bin. Which was very conscientious of him, but didn't help my choice. I got a bit of whiting for £1.50, no idea what it'll be like. I was hoping to make fish chips and mushy peas tomorrow, but I went into three shops and none of them had the dried peas which I wanted, only tinned, frozen, etc. I'm getting used to people in shops looking at me like I'm mad, now. Anyway one of the places I looked for split green peas was Tesco, and I couldn't help noticing Tesco are now selling single giant custard creams. I also couldn't help noticing they are in size about the equivalent of 3 normal custard cream biscuits, and cost 85pence, or as much as two whole packets of regular custard creams. Nice profit maximisation there, guys. One of these had about 220 calories in it, or 10% of your recommended daily intake. I've been feeling a bit bad about the amount of lard and dripping I've been eating this week, so I idly did a lard to giant custard cream calorie conversion. Basically, if you eat one of those giant custard creams, you might as well eat this lump of lard. In calorie terms, I mean. I am sure the custard cream has lots of other, er, nutrition, in it. It's so nice to know how much our food has got healthier in a century. Today was pie day, which I was looking forward to. 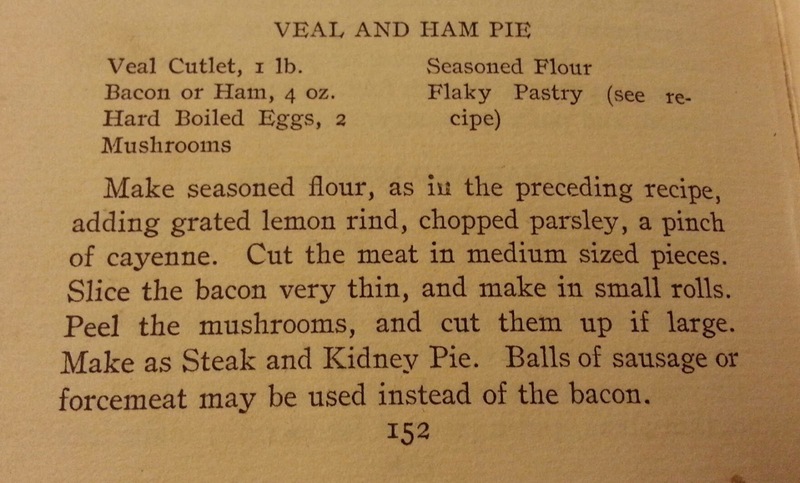 I'd planned this Ham and Veal pie because I knew I could get some ham in the farmer's market. Turned out I couldn't get veal, but I got a small piece of steak instead. It wasn't the cheapest midweek meal, I paid about £3 for a small bit of steak and the ham, which made enough pie for two people or two meals. I had half the ham left over, so not extortionate but definitely a bit of a treat. I didn't follow the recipe exactly - for a start I made short pastry. 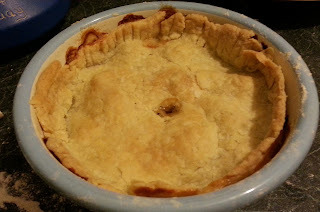 The pastry recipe was 8oz flour, 2oz butter, 2oz lard, salt and baking powder. I got a bit distracted and forgot both the baking powder and salt: it didn't miss the baking powder at all, but would have been better for salt. I only used half this amount of pastry, as it's topping-only pie. 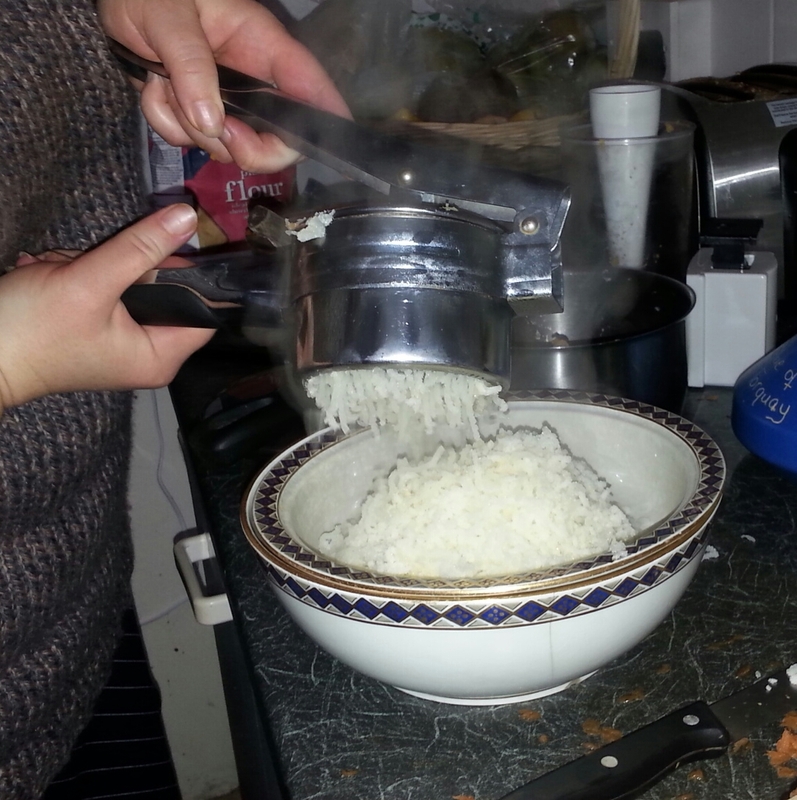 I struggled to find a dish the right size, and ended up cooking it in a pudding basin. (Moral of this story: I need to buy a pie dish.) I didn't include the eggs, I had quite enough filling with mushrooms and meat, and didn't use nearly as much meat as she suggests, more like 4oz steak, 4oz ham, and about 6oz mushrooms. I was a bit nervous of the whole 'seasoned flour' thing, which I'd never come across before, but I did go for it with lemon peel, cayenne and parsley. It seemed odd you didn't have to make a gravy, but I presumed that the seasoned flour and the water top-up would create one, which, in the end, it did. For heaven's sake don't make this without the water top-up, that's pretty important! The pie took an hour on gas mark four. I was absolutely ravenous by the time it was done but my god was it worth the wait. The pastry was crispy and crusty, the flour and spices had all cooked in with the two kinds of meat, and the gravy was spicy and peppery, exactly what you'd want for a winter night. Not a lot of hassle to cook, and I'm sure you could do the same thing with shop bought pastry, but it did take a while in the oven, either way. Don't tell anyone I told you, mind, but pastry with lard is delicious.I had it with mashed swede, which was a good combination. Had the oven on, so cooked a couple of the conference pears to dessert. Perfectly nice, but not as nice as the ones cooked on the hob the other night. I'm starting to get used to the chore of cooking something every night, and less craving for junk food going on. 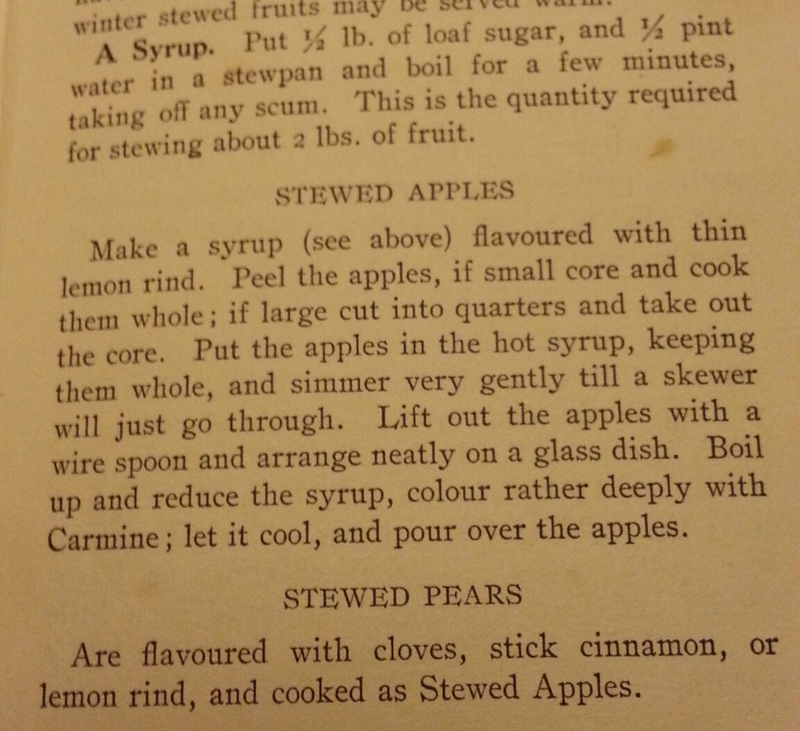 I'm also starting to get the hang of Miss Congreve's recipes, and starting to feel like I know her a bit! Less adventurous today. Made porridge for breakfast, but can't see for the life of me why you'd want to cook it as long as this? It was fine, but oatmeal tended to clump together more than regular oats when cooking. 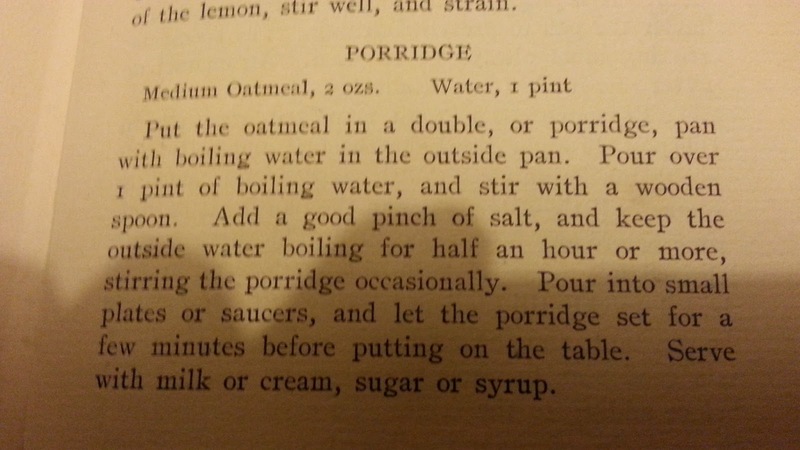 I don't understand why you wouldn't use whole oats - were they seen as something rustic, maybe? For dinner I made Macaroni Cheese which is cunningly a one-pot recipe. It was really nice, and quicker than doing it in the oven. It'd never occurred to me to put cayenne in the sauce, but I did put a pinch, and some mustard. The sauce was great, really thick and creamy. Also cooked some greens, and finished off last night's pears, cold. All this Edwardian food is doing an excellent job of keeping me off the junk food, though I did have to have toast and jam when I got home from work. The one thing that I'm not managing to stick to is the teabag thing - it's all very well making a leisurely pot, but not when you just want to get up and go to work. Have totally given in on the teabag front, but on the plus side, haven't touched the Caramel Wafer bars. Tomorrow is farmer's market day, so I'm going to try and get ingredients for a pie. 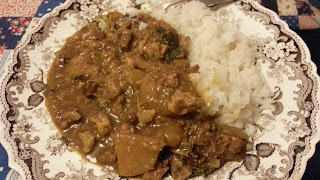 Today is leftovers day, carrot soup for lunch and curry for dinner, made with leftover lamb. 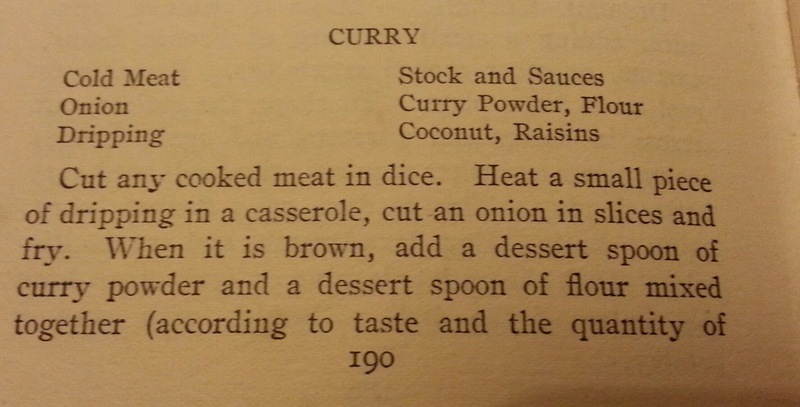 The curry got off to a bad start - I'd never cooked with dripping before and when I fried the onions in it, it smelled grim. It did however cook the onions really evenly without burning or browning. I added the meat, gravy, flour and curry powder. At this point it tasted like chip shop curry sauce. I assumed the proofreader was having a breakdown on this particular page - no way was I adding Worcester, tomato, mushroom and anchovy sauce. I assumed she meant or not and, and used Worcester. I added leftover turnips (she's very against potatoes in curry, for some reason, so I kept those back) raisins and coconut, and I left it to cook for a while. This definitely improved matters, but did have to pop back and stir every few minutes to stop it sticking. I couldn't get the gas ring as low as the recipe suggested, so I turned it off for 20 mins or so to marinade. When the rice was ready I added the lemon and also some chopped mint from yesterday's mint sauce, warmed it up and dished it out. At this point my hopes weren't especially high, but this turned out to be a really decent curry in a kind of Afghan/Northern-frontier sort of stylee. Not that hot, but I used mild Caribbean curry powder, which has tamarind in, and with the coconut, lamb and mint it went together pretty well. It wasn't a sophisticated curry but very easy to make, the only thing that took a bit of time was just leaving it to let the flavours sit in. I've never had turnips in a curry before, but they're always in the Asian grocers near me, so I guess it's bona fide. 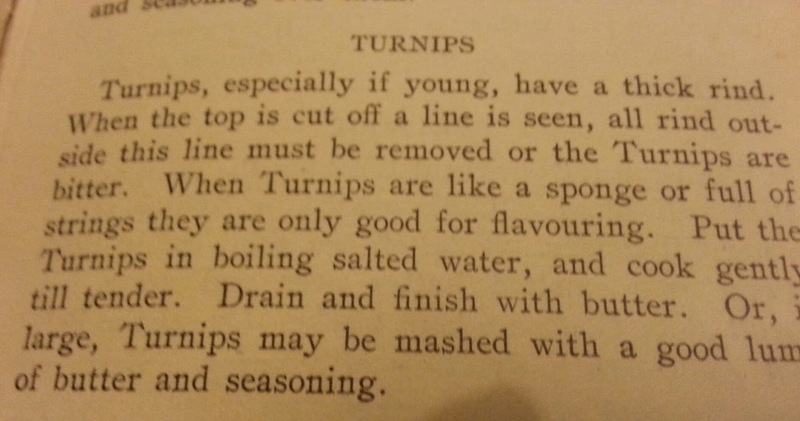 The turnips tasted good and kept their shape better than potatoes. So in the end I was really happy with the result, though I couldn't go so far as to describe it as a good-looking beast. It was brown. Overall, a very decent weekday dinner with surprisingly little hassle. I also had two big bags of slightly hard conference pears, so I made this stewed/poached fruit recipe, halving the syrup amount, with just a bit of cinnamon stick in it. This cooked three pears, halved. I also found a bit of cream cheese in the fridge that needed eating, so I popped that on top. I literally can't overstate how fantastic this was, both light and fragrant and yet somehow winter-warmy comfort food at the same time. The cinnamony sugar syrup was fantastic. It took hardly any effort at all, and looked right posh. 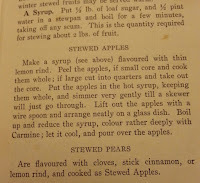 I've no idea why this isn't a thing people cook any more - ok it seems like a high sugar recipe, but compared to a prepackaged pudding or a fizzy drink I'm not convinced it's any worse. Half the pears left to eat tomorrow, yay! Wake up, want a cup of tea and realise that I can't use teabags. I have fallen at the first hurdle: I have failed Miss Congreve's required domestic standards on teapot storage, and am met with this horror. Fall back on the reserve teapot. I do have tea, in a tin, that would meet with her approval, a gift from colleagues from Hong Kong. My dinner party has been reduced from four to two due to winter ailments and people falling off bicycles, both of which seem era-appropriate. 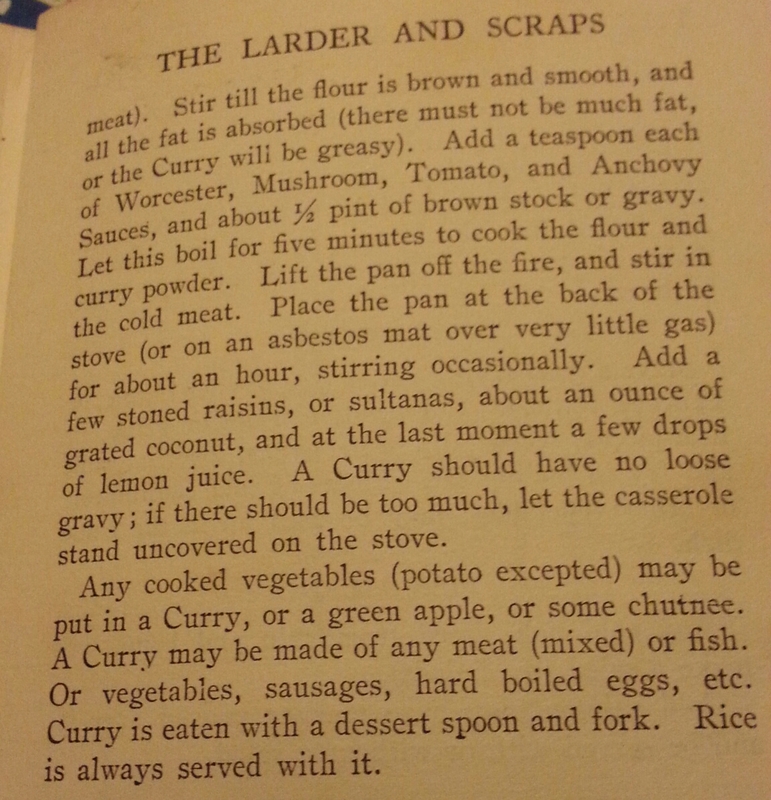 A couple of other friends I invited don't reply, which makes me think they're a) scared of my cooking or b) scared of the Edwardian cookery. It's really not that odd, people. I put the rice pudding on. 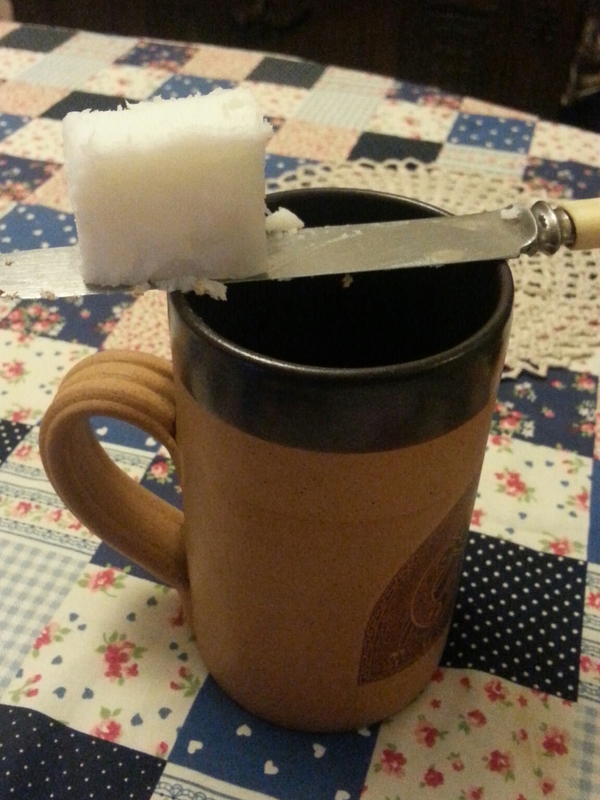 Two teaspoons of sugar is abstemious, by modern standards. Carrot Soup; Roast lamb & mint sauce, potato snow, buttered turnips, cabbage. Rice pudding for dessert. Successes: The lamb was fine. 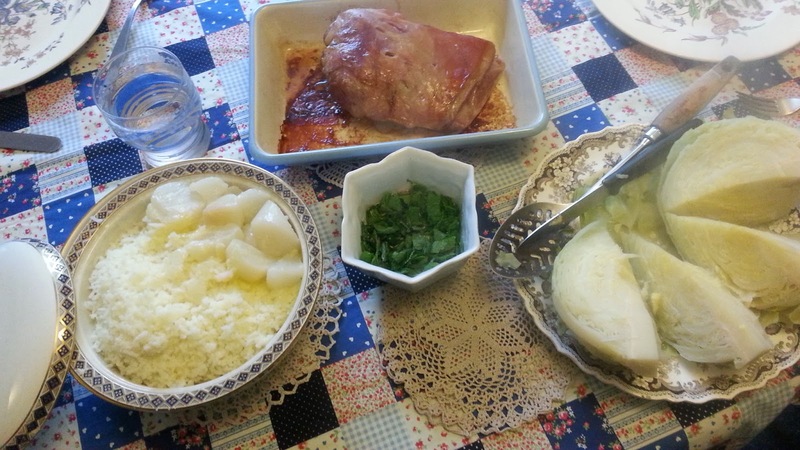 The buttered turnips were excellent. 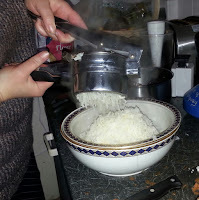 The potato snow is a recipe I'd made before and expected to be dry but putting the potatoes through that top Edwardian gadget, the potato ricer, means they come out light, airy and fluffy. 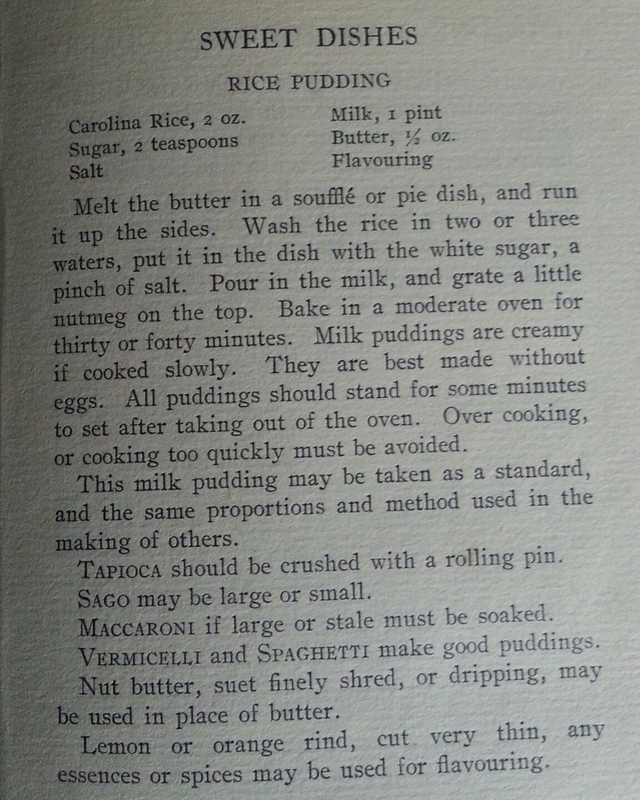 The rice pudding was also good and very easy. Unexpected star of the day: the carrot soup. I'd picked this because I thought soup would be expected and this seemed simple and healthy. It turned out to be the best bit of the meal: just delicious, buttery, fresh-tasting and bright as a tangerine. I will definitely cook that again. Neither sugar nor colour was needed. My friend Louise was impressed with this dish I got in a charity shop. It has two bowls that fit together, you pour cooking water from the veg into the lower one, then add the second bowl with the vegetables, and a lid, so the vegetables stay warm on the table. It's Victorian genius, and we couldn't work out why no-one makes them any more. 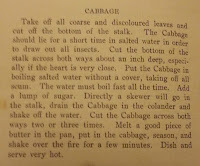 I wanted to do this cabbage recipe, but hadn't reckoned with how long it takes to get a huge pan of water with a whole cabbage in it from cold to boiling, and the stupid thing just wouldn't set in to boil. So it wasn't ready in time. 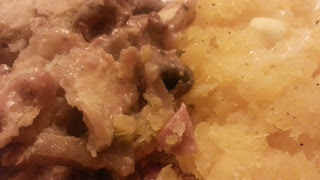 We quartered and ate it anyway, but didn't have the time to do the frying in butter thing. Gravy: I completely forgot to make gravy because I was stressing over the cabbage! Also, I hadn't spotted that the mint sauce needed to be made the night before, so it hadn't marinaded. Leftovers: Louise took the cabbage away to try the butter-frying thing at home. Leftovers from most things, which is ok as I'd planned Monday as leftovers day. State of the kitchen: looked like mayhem, but washing up not as bad as expected. State of me: muck sweat. Wrangling massive pans of cabbage is hard work. Falling off the 1913 wagon incidents: I tried to mash the carrots for the soup in the potato masher, lost patience and used the hand blender. Sorry. 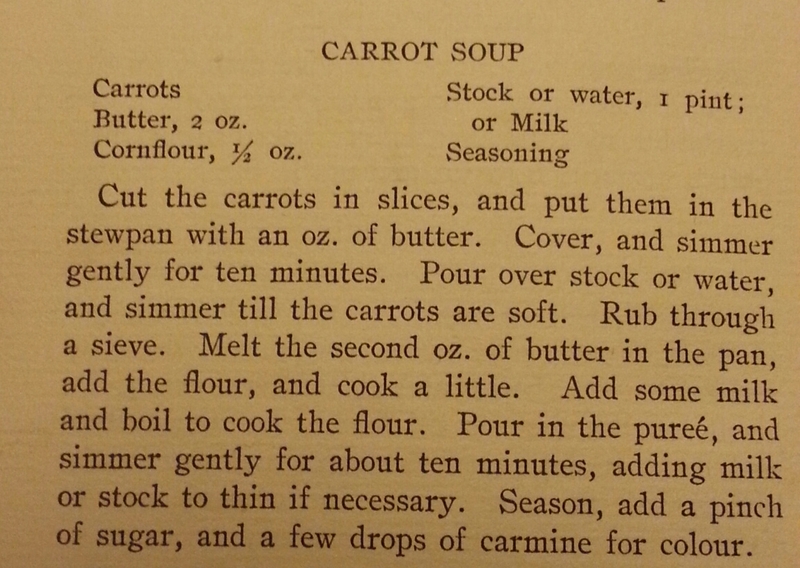 For supper I had more carrot soup and toast, and finished off the rice pudding. Been shopping up Gloucester Rd and a couple of other places. In 1913 I could have probably knocked the whole lot off my list on neighbouring Stapleton Rd, then a major shopping street but rather run down since they stopped the local train station from being an interchange, and built the M32, cutting off half it's business. I'm not feeling 100% after a week of seasonal lurgy so I decide to get the train up there, first stopping at local Asian grocers, Sweetmart, to purchase fresh mint for mint sauce, and some oatmeal. The oatmeal causes confusion, I keep being directed to the oat milk. Modern problems, huh. Quite a few items on my list are things I'd normally buy, but two I'm expecting to be a bother: gravy browning and dripping. Third butcher's shop coughs up the dripping: hurrah! I get excited when I see they're advertising rabbit, but apparently the rabbit is all sold out. I buy dripping, and bacon. Greengrocer's is stress-free and cheap. I'm trying to follow Miss Congreve's advice about buying seasonal, good quality stuff. I've already made a plan of what I'll cook over the week, and have no trouble getting everything on the list. I'm figuring British grown or ship-imported is ok, which works out fine for veg but, in January, leaves me very short on fruit. I do buy two bags of British comice pears which are on offer, and sadly walk past the Moroccan raspberries. I also eschew a couple of items which I'm really sure would have been British-grown in 1913, and no now longer are. Next place is the rather posh butcher's and I want lamb for a roast. I can't see any so I ask. From here it all goes downhill. The lad says they have 'anything', proceeds to grill me as to whether I'm planning to slow cook it (I'm not) and offers a huge leg of lamb despite me saying its for 4 people. He then tries to cut up what looks like the most expensive piece of lamb in the place without telling me, despite my requests, how much it might cost. He demands, rudely, how much I'm planning to spend. I'm hoping it'll be under a tenner, but don't want to say so because then he'll be sure to charge me that, and anyway there's loads of posh twats hanging round who probably don't blink at spending £30 on a joint. So I tell him to serve the next person and slink out. How bad a salesperson do you have to be to fail to sell a joint of meat, in a butcher's shop, to a woman who wants to buy a joint of meat? I went to the Co-op and bought a piece of Welsh lamb for £8. I was hoping the Co-op would sell gravy browning but they didn't. I opted instead for Bisto powder (not granules) which apparently launched in 1908. (The Granules came later). This involved me standing in the Co-op aisle, googling Bisto's product launch dates, like a pillock. I also wanted a tin of fruit but the Co-op's were in fruit juice, which I am sure would make Miss Congreve shudder. One thing that's quite conspicuous is that by only buying things you could have bought in 1913, you immediately write off about half the supermarket items. Mostly the ones that are bad for you, it has to be said. Alas, this will never happen. Anyway, having made it home I set off for Lidl for a few remaining bits and pieces. I get excited when I spot Tunnocks Caramel Wafers, as this may be some legitimate 1913 junk food. Google tells me the company started in 1890, so I buy some. When I get home, I find the wafers began to be produced in 1947, so at the back of the cupboard they go. I also buy salmon paste for sandwiches. Lidl tinned peaches have proper sugar syrup. Hurrah! I've spent £32, a bit more than normal but some of this stuff will last well beyond the week. I've bought conspicuously more dry goods than normal, and also more tinned stuff. I don't normally cook a Sunday roast so that's part of the extra expense. 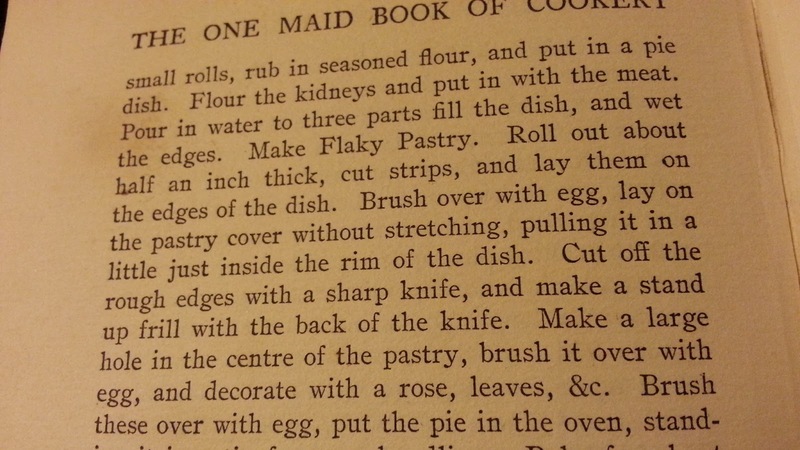 As some of you may know, I'm a fan of old cookbooks. 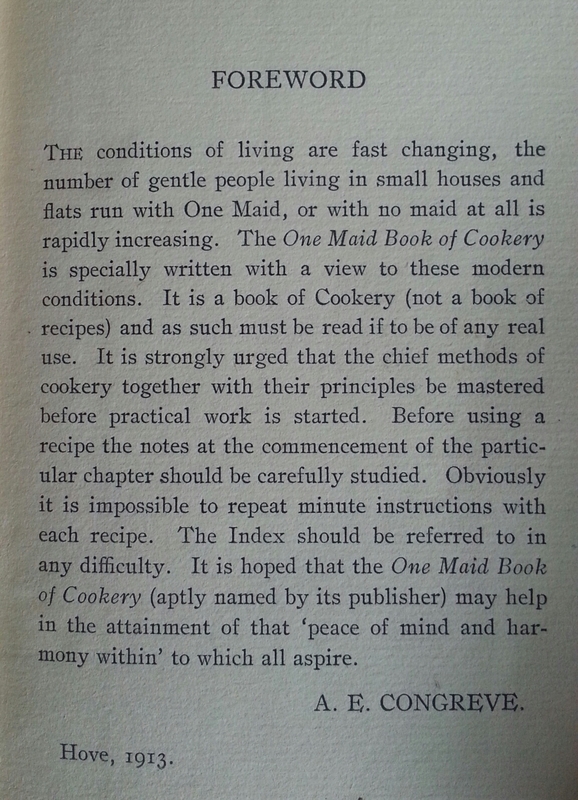 January is a quiet month, and one thing I've been meaning to do for ages is spend a week living out of this, The One Maid Book of Cookery, by AE Congreve, published in 1913. 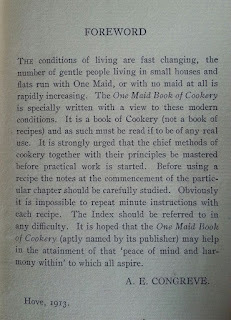 The One Maid Book of Cookery isn't a famous cookbook like Mrs Beeton, but it is a) reliable and b) socially quite interesting. 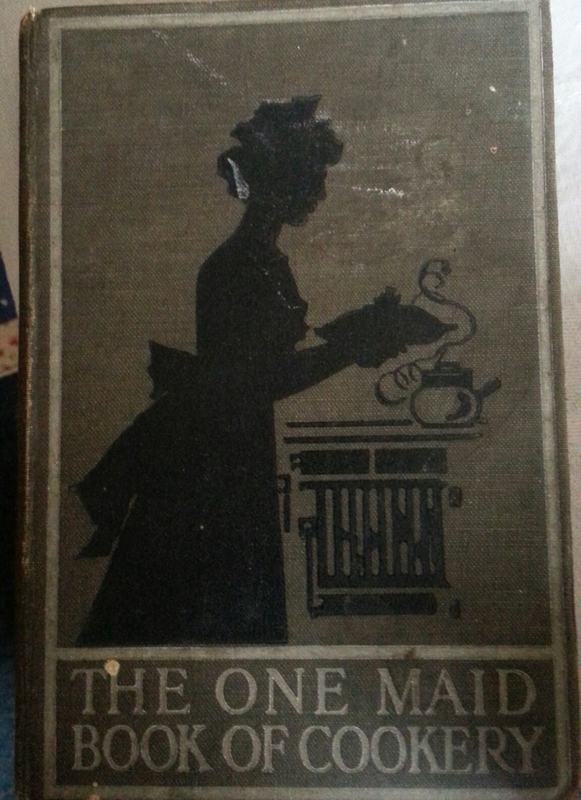 The One Maid Book of Cookery isn't just aimed at those with one maid, it's aimed at a social phenomena new in the Edwardian era: working women, with a salary, who lived alone. Which is basically me, which is why I'm curious. Anyway, from next week I'm going to be living entirely from the cookbook, breakfast and snacks included, Sunday to Saturday, kicking off with Sunday dinner and ending with a Saturday high tea. This is partly so I've got the Saturday to get ingredients which may be different from what I usually eat. I'll be blogging what I end up eating and rating it for various things like how easy it is to make, what it tastes like, as well as any problems I had cooking it. (I cook most nights, so that's not a departure.) I'll also be trying to stick to more or less to my regular food budget, and since no-one in Edwardian England would have a freezer, anything frozen is out. 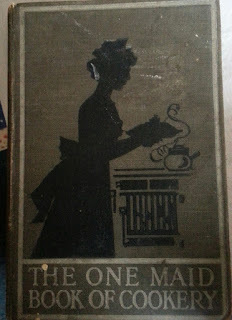 As far as possible, I'll be getting things from local independent shops, like my 1913 counterpart would have done. Anyway, updates on here from next Saturday (16th). I've invited a couple of other people with food blogs for Sunday lunch, so you should be able to read their thoughts as well. The carrot soup was to die for! Tasty and rich with a wonderful buttery deliciousness. The lamb was tender, just as it should be, with freshly made mint sauce. The potato was light and fluffy. Alas, due to time limitations, the cabbage missed out on a little frying in butter. 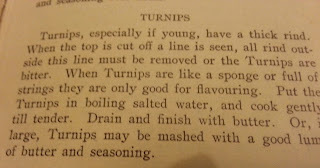 The turnips made me ask, Why do I never think to buy them? and added a gentle crunch to the meal. 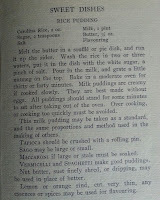 To finish, there was rice pudding - moist and sticky, with a dab of home-made apple jelly. Perfect. Hello, just found your blog from a tweet. I'm intrigued! 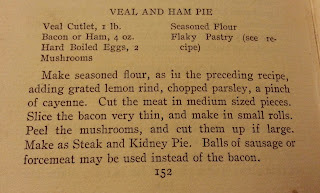 Your pie looks scrummy. 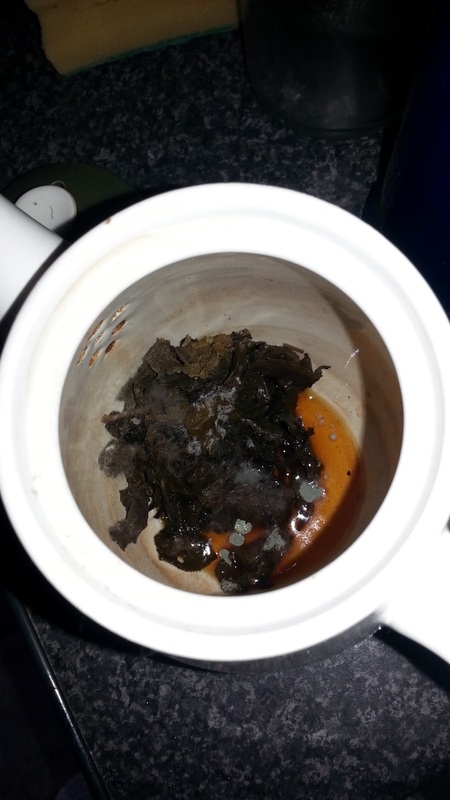 I drink loose leaf tea all the time for many reasons, one of them being that I drink tea about 8 times a day so if there are any toxins in teabag material I'd be getting a lot of them! If you set a stainless steel infuser (or ordinary tea strainer) over your cup or mug, put in the loose leaf tea (and top with a saucer or other lid, if you like) and then pour on the water, it's no more trouble than a teabag. Of course! Why didn't I think of that? Duh. I even have a tea strainer. I must dig it out. Thank you! I don't know about "Edwardian" - this is very similar to the food I ate growing up in Bristol in the 1960s (although, to be fair, my mother was 40 when I was born and we did have some very elderly Devon relatives - born in the 1880s/90s - we used to visit every other weekend).